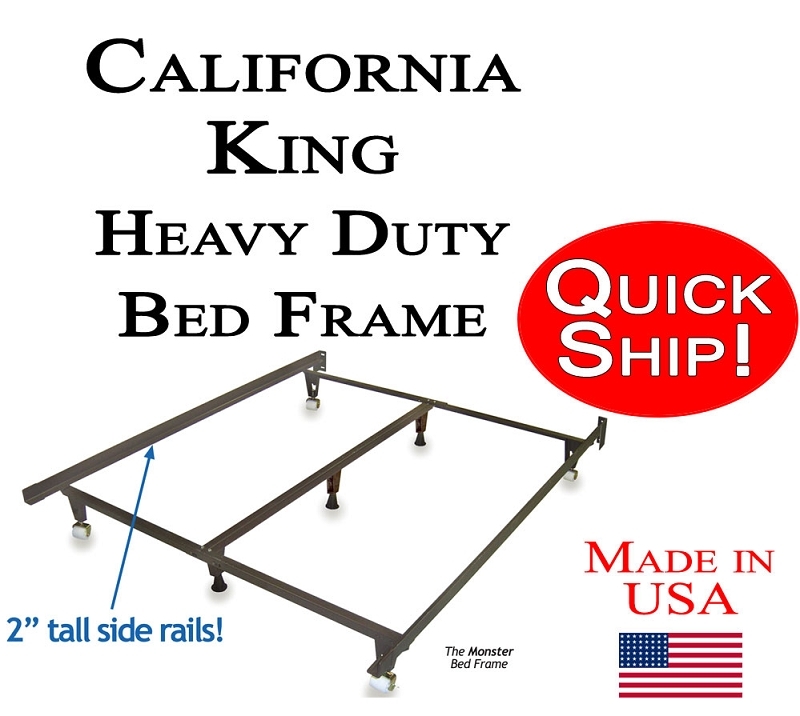 California King Quick Ship extra heavy duty metal bed frame fits mattress sets 72 in. wide x 84 in. long, EXTRA HEAVY DUTY available with large wheels or floor glides. This frame includes a heavy duty center support bar down the middle with three additional support legs. Easy 5 minute assembly. This frame comes with brackets at the head of the bed to use with a bolt-on headboard if you wish, it is not necessary. The bolts for the headboard are not included because different headboards take different size bolts. This frame will lift the box spring off the floor about 7.5 inches. Also adjusts to fit Twin, Full, Queen, and King Sizes with extra heavy duty center support for all of these sizes. In Stock - ships in a business day or two plus transit.